Eating right foods at the right time along with proper exercise is the best way to reduce your tummy (abdomen). 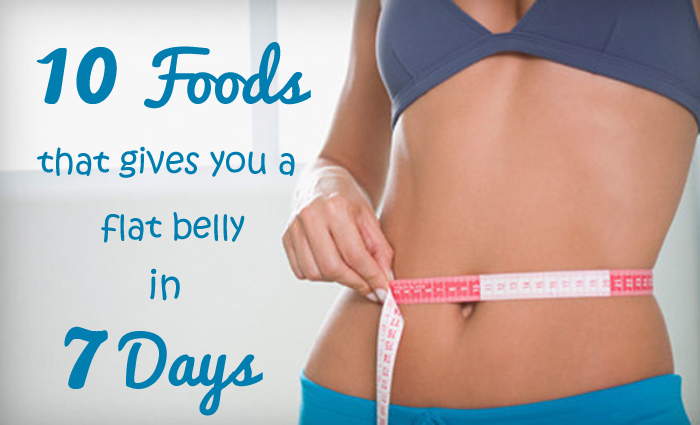 You can lower your belly fat by modifying your diet. Here are some foods to reduce your tummy size. You should drink around 8 glasses of water per day. Replace all other beverages, especially fizzy drinks and carbonated and sugar drinks which are full of empty calories. This will keep your bowels moving and will help to flush out toxins from your system. This will keep your body hydrated. You can analyze the hydration status by analyzing your urine. If you are hydrated well, your urine should be a light yellow or clear color. If it is dark yellow with an odor it indicates you are dehydrated – Increase your water intake. If you find drinking regular water boring, then try “sassy water” instead – Sassy water is spruced up water named by Prevention magazine in honor of its inventor Cynthia Sass, who created it for the “Flat Belly Diet”. This water tastes well and is having almost no calories. The ginger content also helps to calm your digestive system. Learn how to make Sassy Water? A recent research conducted by University of Purdue has found that though almonds are good to lower your tummy fat. Almonds do not contribute to belly fat. In addition, they contain vitamin E, which is good for your skin. Almonds are also high in fibre and protein content. Fibre rich, will satisfy your hunger and improves the digestion process, leading to a flat stomach. They are also low in calories, with ten almonds costing you approximately 78 calories only. Unless your blood cholesterol levels are high, you can safely take one egg per day for breakfast (poached, boiled or scrambled eggs). According to new research from the Rochester Centre for Obesity in America, eating eggs for breakfast could help to limit your calorie intake throughout the rest of the day, by more than 400 calories. Eggs are a source of complete protein. They supply all essential amino acids for humans and provide several vitamins and minerals, including vitamins A, B2, B9,B6,B12, choline, iron, calcium, phosphorus and potassium. Hard boiled eggs are easy for digestion and free from salmonella poisoning. Include more fruits in your diet. Fruits like apple, pappaya, tomatoes, water melon etc are rich in water. Infact 85% of an apple is water. So these fruits wont increase your weight, but they will suppress your appetite and desire to have more food. Studies have shown that eating an apple before mealtime can lower your intake of calories during your dining to a significant amount by about 15%. Apple has low calories, 100 g of fresh fruit slices provide only 50 calories. The fruit is rich in dietary fibers and anti oxidants. They also contains good quantity of vitamin c and beta carotene. Apple also is a good source of riboflavin, thiamin, and pyridoxine (vitamin B-6). These vitamins help as co-factors for enzymes in metabolism as well as in various synthetic functions inside the body. Fish is a food that is full of satisfying flavor, low in calories, and stocked with heart-healthy omega-3 fatty acids. These Omega-3 fatty acids are essential fats that our bodies can’t make it in house. They also help keeping the blood from clotting too easily and add to a better cholesterol ratio – reduces risk of cardio vascular diseases. Fatty fish tend to have more omega-3s than leaner fish, but even “fatty” fish contain less fat than lean beef or chicken. Even canned fish like tuna, sardines, and salmon, when eaten bones and all, pack your meal with plenty of good-for-your-bones calcium, too. Rice, wheat etc are rich in carbohydrates. Replace them with dosa, upmav etc made using maize. Maize is rich in protein and vitamin B. Add more vegetables in your diet. They have high fiber content. Include vegetables like Spinach, broccoli, cauliflower, carrots etc. Eating vegetables is associated with a lower risk of colon cancer, diabetes and heart diseases. Trying different vegetables can add a variety to your diet. These include cheese, cream, butter, full-fat yogurt etc.. They are rich in healthy fats, calcium and other nutrients. A study published in 2012 proves consumption of high-fat dairy was associated with a lower risk of weight gain over time. It is also found that, they are good source of Vitamin K2 and can lower risk of cardiovascular diseases also. Above mentioned items are those which you can include in your food. It is important to notice that there are some food items which will cause fat deposition in your body and will cause increased tummy size. You have to avoid these foods from your diet. Cut the CRAP : Avoid the four main food groups that cause fat deposition in our bodies: Caffeine, Refined sugar, Alcohol and Processed foods. Avoid sodas, energy drinks etc..
Avoid white bread which are low in fiber, high in carbohydrate and leads to a hike in blood sugar level. Don’t give in for fast foods. Fast foods are the one making you fat. Avoid chewing gums – as you chew gum, you swallow air which gets trapped in your GI tract and causes pressure, bloating and belly expansion. Avoid foods which are gassy – cabbage, onion, dals etc. Always have your breakfast – If you don’t have time for a proper breakfast, just grab a piece of fruit and few nuts. Don’t eat after 8PM / Don’t go to bed with a full stomach. Eat for change – Eat early, Eat often, Eat slowly, Eat green. Eat slowly and chew foods well – When you eat quickly, you take in large gulps of air without realising it. Take a 5 minute walk after a meal. Dont talk while having food. Get atleast 7-8 hours of sleep every night. Cut out fast food, soda, sodium. Five servings of fresh fruits or veggies. Enrich your diet with fiber. Proper exercise – Do cardio 20 minutes, 5 days a week. Do push-ups. Leg lifts, climb stairs. More than all above – Stay inspired and don’t loss your determination. PS : Always its better to make an appointment with your doctor before attempting to lose weight. He / She can help you decide how much weight to lose and how quickly. This entry was written on May 25th, 2014 by Renoos. Posted in Food and Health and was last revised on May 25th, 2014. I am working in saudi, born in Kerala. I am non veg but preferably veg. I am of age 29, lean and weight 66.. I would like to follow a healthy diet here. Can u suggest the items to include in diet. Thank you.